While I was growing up in the Meadowlands there were no Peregrines for anyone to see. By the mid-1960’s Peregrines had disappeared from the eastern United States and by the mid-1970s western populations were down by 90 percent. Loss of habitat, shootings, egg collecting and other human disturbances had weakened the North American population for decades but the severe drastic declines didn’t occur until the widespread use of a popular pesticide, DDT was introduced into the environment. DDT caused eggshell thinning in contaminated birds and the thin-shelled eggs cracked under the weight of the adult falcons. Lucky for the Peregrine, and us, there were people that believed they could bring these magnificent birds back from the brink of extinction. Nearly 40 years ago the Peregrine began its long road to recovery with the outlawing of DDT and the passage of the Federal Clean Water Act and the Endangered Species Act. Recovery work began in 1975 after the U.S. ban on DDT. 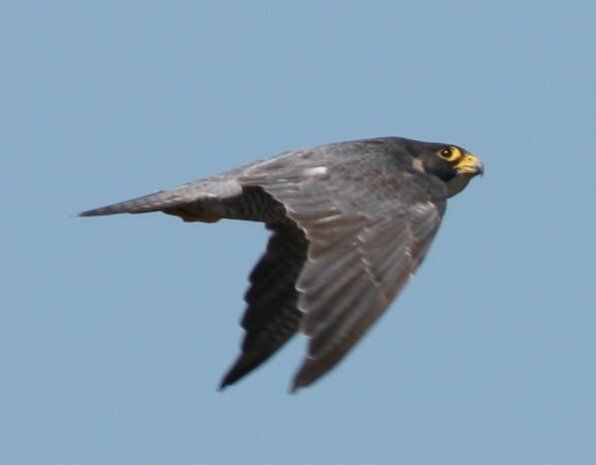 The NJ Division of Fish and Wildlife and the Peregrine Fund first hacked falcons in 1975 at Sedge Islands Wildlife Management Area in Barnegat Bay, and expanded to several more sites until pairs established territories. Wild nesting first occurred at Forsythe National Wildlife Refuge in Absecon in 1980 and expanded slowly until 1993, when the population stabilized. While still listed as an Endangered Species in New Jersey, the 2014 New Jersey Peregrine Falcon population increased slightly from 26 to 29 pairs occupying nest sites across the state. Out of 27 pairs that laid eggs, 18 fledged at least one young . In the Meadowlands area they now nest on bridges and buildings and display their lethal hunting skills by plunging into their relentless deadly dives at almost 200 miles-per-hour. They can often be seen at DeKorte Park, Mill Creek Marsh Trail and along the legendary Disposal road. The Meadowlands is also prime hunting territory, where you might find them preying on birds as large as a Great Blue Heron and as small as a Kinglet. Now that Peregrines search the skies over places like the New Jersey Meadowlands once again as monarchs of their domain, fearless and unafraid, we should be diligent never to take the sight of this extraordinary bird for granted, not even once. Not even a single glance should go without the proper reverence as it would lessen the struggle and triumph of such an incredible creature. There are special times in our history that we have simply done the right thing, despite the cost, the negative naysayers and politics involved. We have stepped up to perform noble tasks such as protecting a remarkable bird like the Peregrine Falcon. Now school children get to watch in awe as the fearless predator of the skies performs its ageless obligation , patrolling places like our Meadowlands, the way nature intended, the way it should always have been . I am a new bird photography enthusiast and your article led me to find out about the Meadowlands water shed, which made me extremely happy, because I myself don’t know much about where to go find birds. Thank you!! I shall spy out falcons and others very soon.